lncRNAs can interfere with gene function at multiple levels. 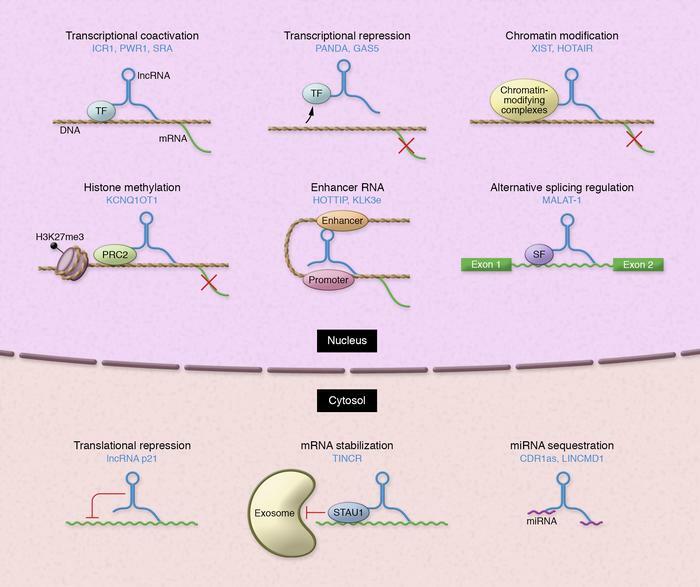 Studies have described a range of mechanisms by which lncRNAs regulate their targets. In the cell nucleus, lncRNAs can regulate transcription by recruiting chromatin-modifying complexes and transcriptional factors to silence or enhance target gene expression. Additionally, some lncRNAs regulate gene expression by influencing pre-mRNA splicing. In the cytosol, lncRNAs can regulate mRNA expression by altering mRNA stability, mRNA translation, or by competing for microRNA binding. ICR1,Interfering Crick RNA 1; PWR1, Promoting Watson RNA1; SRA, Steroid receptor RNA Activator PANDA, P21 associated ncRNA DNA damage activated, PANDA antisense RNA GAS5, Growth arrest-specific 5; TF, Transcription factor; XIST, X-inactive specific transcript; HOTAIR, HOX transcript antisense RNA; KCNQ1OT1, KCNQ1 overlapping transcript 1; PRC2, Polycomb Repressive Complex 2; HOTTIP, HOXA transcript at the distal tip; KLK3e, Kallikrein-related peptidase 3 eRNA; SF, Splicing factor; STAU1, Staufen Double-Stranded RNA Binding Protein 1; TINCR, Tissue Differentiation-Inducing Non-Protein Coding RNA; CDR1as, Cerebellar degeneration-related protein 1 Antisense RNA; LINCMD1, long intergenic non-protein coding RNA, muscle differentiation 1.